Fresh Mozzarella & Tomato salad. A nice light and tasty appetizer to start with. Fresh Seafood served with pasta and a spicy tomato sauce. A very delicious treat! We serve only the best classic Italian dishes with the best wines to pair with. Perfect for a Romantic dinner. or please make them here on our site. We hope you join us for Dinner! 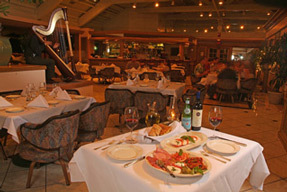 We also offer a space for Dinner Rehearsal, Wedding Receptions or other Events. Please call us for inquiries. Imagine a tropical Italy or a Hawaiian Riviera. 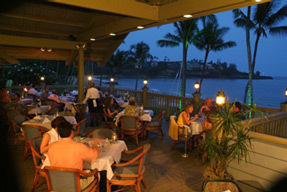 That's what you'll find at this northern Italian restaurant overlooking Kalapaki Bay. 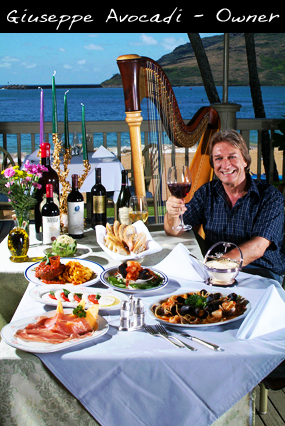 Owner Giuseppe Avocadi was born and raised in Italy, when he opened his Restaurant on the Island of Kauai, "Kauai reminds me so much of the Italian Riviera", Mr. Avocadi says.
" A marvel of contrast between mountains and sea surrounded by palms and fields of vibrant greens…..
and Bistecca di Vitellone, all enhanced by sauces with an Italian Soul. Bon Appetite loved Portofino's fresh Marinara sauce. Home made Gelato and fruit sorbets are prepared daily. There is a cappuccino and espresso bar, so you can linger over exotic coffees after dinner. 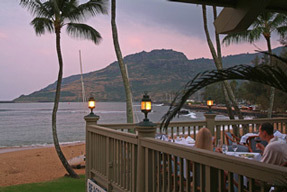 ___America's 200 most romantic restaurants.